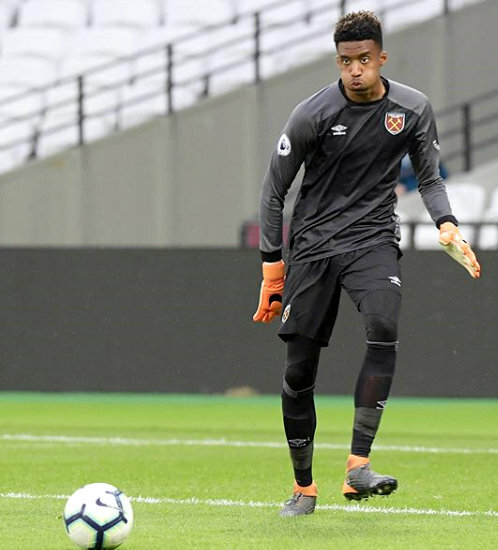 Nathan Trott and his West Ham United Under 23 teammates Group A Premier League International Cup campaign came to a close with a 3 – 0 defeat at Southampton's Academy Training Ground. As early as the 10th minute trot was in action, a clever ball was clipped over the West Ham defense and into the path of Tyreke Johnson, who played it across for Afolabi to tap in, but Trott dives to make a smart save from close range. Southampton took the lead in the 27 minute, a ball from Will Smallbone from the right-hand-side found Tyreke Johnson in the center who fired in from point blank range past Trott. Three minutes later it was 2 – 0 to the host, Marcus Barnes collected the ball inside the box and hit his shot which went under Trott in goal. In the 36th minute Southampton were feeling good about things and continued to press forward, the powerful Jonathan Afolabi strides towards goal before feeding goalscorer Barnes, whose attempt is weak and straight at Trott from 20 yards. In the 66th minute Southampton would take a 3 – 0 lead and it was ruled an own goal from Trott. A corner kick over on the right-hand-side from Smallbone is fumbled by the keeper who couldn't stop it crossing the line. Trott would be so disappointed with that one. He doesn't make too many mistakes, but as so often is the case with goalkeepers, it's crucial when he does.